There is a shortage of firefighter and other EMS workers across the nation, especially when it comes to volunteers. Might emergency services be for you, either as a career professional or as a volunteer? In this interview, we talk with Mike, training center coordinator at AED Superstore, the world’s largest distributor of automated external defibrillators, and discuss his career in EMS. …So ended my interview with an emergency medical services (EMS) worker named Mike regarding what life is like for firefighters, EMT’s, paramedics, etc. He is now the training center coordinator at AED Superstore, the world’s largest distributor of automated external defibrillators (AEDs), as well as his community’s assistant fire chief. Mike’s current positions in firefighting and first aid, CPR, and AED training are a natural result of his lifelong work in all things emergency. Getting a call from dispatch was a fitting end to my hour-long conversation with Mike. He has had a varied career in emergency services and I felt I had hit the jackpot as I interviewed him to get a picture of what life is like working in the EMS field. Taken from a wider view, Mike’s EMS career started in childhood as he began rescuing imaginary victims. He imagined people were trapped in snow caves dug into the side of mounds created by snowplows passing in front of his childhood home, then spent his playtime energy getting them out alive. This natural passion which emerged when he was a 5-or 6-year-old kid (“I wanna be a firefighter”) spurred entrance into his high school Firefighting Recruit Academy his junior year. Completing the academy equipped him with a technical diploma and sufficient knowledge to take state firefighter certification tests which led to a fulfilling EMS career. As I discovered talking to Mike, at the core of his life experience in EMS are impassioned values of helping people, working as a skilled team member, acting bravely, and thinking cool-headedly in situations where most people instinctively run the other way. MIKE: “I actually started in public safety as a junior firefighter while still in high school, at a small fire department in Door County, Wisconsin and, once I turned 18, I was able to become a full member. I went through State of Wisconsin level 1 and level 2 firefighter training, completed both of those courses and also became an EMT Basic. I was offered the opportunity, through a private EMS company I worked for, to go through EMT/IV (intravenous) technician training, an advanced level that trains EMT’s to start IV’s and deliver some life-saving but relatively safe medications. Being able to do this reduces the number of people who require transport to an emergency room. A good example is diabetics who can be treated on scene, preventing them from having to spend 4-5 hours in an emergency room. I was hired by the city I retired from and was immediately put through paramedics school, then spent just shy of 13 years as a paramedic. For the whole time I worked as a paramedic, I maintained my fire background. [Then] I let my paramedic license lapse. 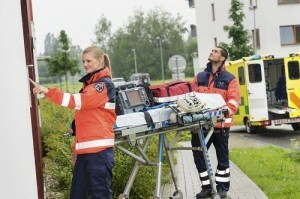 A lot of the reason for leaving the paramedic position was work burnout. We were a relatively busy department—we ran just shy of 2000 calls a year. Our department worked 24-hour shifts, and the burnout rate was pretty high in that scenario. I wanted to explore something that was a little bit different but still in a closely-related field. Looking back it makes a lot of sense I did that, but it was that spark and that passion that was always inside of me…something I wanted to do. I started when I was 16 very early in my junior year of high school.I became a junior firefighter in a volunteer department that only ran 80-125 calls a year. The chiefs we had were all great teachers and really valued young people coming into the service because it provided an opportunity for them to show the young ones the ropes before they make a final career decision. One of our assistant chiefs, who unfortunately passed away in the line of duty, was a huge influence on me pursuing this as a career. One day he said ‘Hey, we were at a big chief’s conference and we heard about this school offering one of the best fire academies and they integrate EMS into it.” He was a big positive influence in my public safety career. MIKE: “The crux of a lot of the training you receive at any one of the levels is critical thinking. 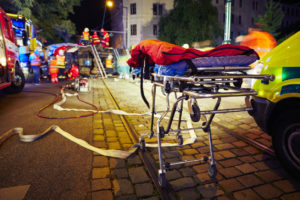 It takes a lot of specialized training for an EMT, Paramedic, etc., to get their brain to function in a way that is difficult to explain to those who haven’t worked in the industry. You have to think almost abnormally, almost against what others would do in the same type of situation. We’re the ones going into a scene that people are trying to run away from. At the same time, we’re trying to maintain our safety and constantly monitoring our surroundings. The training at any level revolves around teaching the emergency responder how to think in a critical and very quick fashion, and to execute decisions that are kind of cookie cutter—see this-do this, see this-do this—but to also maintain the overall safety of the responders and the people who are involved in each incident. MIKE: “A really good way to highlight how all three levels of providers are responding and what their responsibilities are is to take a cardiac arrest patient. In the EMS world, the SCA patient is one of the most complicated calls you can ever go on—there are so many different moving parts in that. The first responders and even lay rescuers, their job is to get there quickly and to start CPR and to deploy an AED as quickly as they can. EMT basics are going to do CPR, place what is called a non-visualized airway (set up so someone can put it into the patient’s mouth, blow on some balloons on the end of that tube and that forces air directly into the trachea and down into the lungs.) The EMT intermediate and/or the Paramedic use the endotracheal tube. They are actually going to put a breathing tube down through the vocal cords and into the trachea. There is no margin for error in where the air is going to go. MIKE: “The ‘When did I stop [expletive]ing my pants?’ question? As an EMT it was a pretty quick transition from being brand new to being fairly comfortable and confident. When I became a Paramedic it was a good year of going on a lot of different calls. My first call as a Paramedic I was nervously confident because the program I went through was the University of Wisconsin’s and I can’t thank my instructors enough for the education they gave us. My first call was pretty serious— a gentleman at one of our clinics whose heart rate was weak and fast, and the medication that we used to correct that [condition] pauses their heart for a moment in time. I was getting ready to give the medication, and my instructor’s voice popped into my head and she told us that when we are giving the medication, that brief pause (and we’re talking a second or less usually) is going to feel like an eternity. You’re going to sit there and watch the cardiac monitor and you are going to want to see that change very quickly— but that brief pause is going to feel like an eternity. MIKE: “It’s a pretty accurate statement and pay varies everywhere. For those who want to make a career, their big goal is municipal employment. Full-time Paramedic/Firefighters are generally organized and represented so they have the ability to negotiate their salaries and benefits. STEVE: “Do you have any favorite stories like administering those meds on your first call? MIKE: “One of my favorite stories is one that I share in every CPR class that I teach. It was a response to an athletic club for a cardiac arrest. We defibrillated the gentleman shortly after our arrival, and by the time we were loading him into the ambulance he was asking what happened. He made a full recovery and we found out later that he got to go see his oldest daughter graduate college and his youngest daughter get married just shortly after his cardiac arrest. STEVE: “Anything else you would say to somebody that’s looking at the kind of career you’ve experienced? MIKE: “If you have a passion for it, follow that passion and let your passion and your desire drive where you end up. I’ve known people that started out in fire and EMS and then went into law enforcement and they’re great cops. There’s never anything wrong with changing a career path right in the middle of beginning it. If you love what you do, it’s going to be easy and you’re going to be good at it. The best thing ever is good firefighters, good Paramedics, good law enforcement officers that love their job and are there for all the right reasons—to help other people when their day has just turned around on them and it’s not going so well. The other thing is that as you get into this, asking questions is where you learn. One of the things I’ve always said, and I say this to my wife quite often, ‘The day I feel I’ve learned it all is the day that I completely retire from all of this.’ It’s an ever-evolving business, technology has made our life easier, has made the outcomes for the people who are suffering these emergencies better. There’s always something out there to learn, something new that somebody’s tried…it’s the experience you learn on that call from talking with another provider and you say ‘Oh, wow, I’ve never seen that!’ And now you’ve seen it and you have a knowledge base to work on that. The day that anybody who’s in this business feels they have learned it all is the day they should retire.